For questions or further information, please click here. TRAIN: The Miracle Ball Method™ Instructor Certification gives you the opportunity to grow both personally and professionally in the method. As you explore the essential components of the method, your teaching skills develop gradually and naturally from that personal experience and understanding. TEACH: After you complete the certification course and receive your certificate, you can begin teaching others based on the level of your training you have received up to that time. This will help you grow as a teacher in the method. INSPIRE: Join The Miracle Ball Method™ community; share experiences; educate your community; ask questions; get advice. The Miracle Ball Method™ (MBM) is a revolutionary approach to health and fitness! This is NOT an exercise program. Exercise is designed to increase muscle tension. The MBM is designed to decrease the excess muscle tension in the body thus allowing ones own alignment system to adjust and rebalance. People are spending more and more time sitting at computers, are dealing with stress from jobs, home, and just everyday life, as a result it is very common to have chronic issues such as low back ache, neck and shoulder pain, carpel tunnel and sciatic pain, just to name a few. All these issues are difficult to relieve because most of us are not aware of how to change some key areas of the body. The Miracle Ball Method™ makes it user friendly for the average person to get results. The MBM Instructor Certification will give you the tools to help people who suffer from a wide range of health conditions. They will also be able to continually use your services, uninterrupted by down-time resulting from these conditions based on the methods you will have learned as a certified Miracle Ball Method™ Instructor. See “TESTIMONIALS” for positive reviews and comments about the MBM method from doctors and physical therapists, trainers and customers. This includes the basics of The Miracle Ball Method™. Begins to give the future teacher a personal experience with how the Method works, an understanding of 4 common ball placements, as well as different breathing methods. The combination of all of this gives the individual many combinations of classes to teach. It encourages the individual to start slowly, teaching small classes with under 8 people, and not to teach those with chronic pain, or high levels of need until they have continued with the program and have more experience. Submit two (2) 20-30 minute videos, six months apart for review. These videos can simply show you teaching a friend, ball placement, explaining the method and observing your student. These videos should demonstrate your ability to explain the Method, observe a student and offer proper position corrections and advice. Note: The demonstration videos are reviewed by Elaine in order for her to evaluate your comfort in communicating the Method. It is so important that we distinguish this from meditating, yoga, relaxation, exercise, trigger point therapy, and massage, to name a few. All of those are wonderful, but this is different. The directions must remain specific to the body so it can readjust and regain freedom of movement, and heal injuries. Growing in body awareness is key. We are essentially just relearning what we once knew. Level 2 can only be taken after completion of the Level 1 training. Level 2 gives instruction on several more ball placements, increases ones skill in observing their classes, and how to identify physical issues in five (5) key areas, and how those key areas impact stress and physical discomforts. At Level 2, a person becomes more fluid in the language of teaching the Method and more skilled at troubleshooting individual needs in their classes, as well as their own needs. A portion of the training will be on how to teach groups. This part of the training is a great way to get more time learning the benefits of the Method, as well as learning a more advanced way of teaching. Level 2 also focuses on how to stand up in front of groups of students, and lets you practice using the ‘language’ of the Method — which is completely opposite from the ‘language’ of exercise. This level is highly recommended for teaching large groups. Submit two (2) 20-30 minute videos six months apart for review. These videos need to show two (2) group classes. If you are not teaching groups, then show a few friends in each video. These videos should demonstrate your Level 1 abilities as well as how you can effectively teach groups of people. Note: The demonstration videos will be reviewed by Elaine in order for her to evaluate your comfort in communicating the Method. It is so important that we distinguish this from meditating, yoga, relaxation, exercise, trigger point therapy, and massage, to name a few. All of those are wonderful, but this is different. The directions must remain specific to the body so it can readjust and regain freedom of movement, and heal injuries. Growing in body awareness is key. We are essentially just relearning what we once knew. Low back Workshop: There will be a focus on the leg joint, a key area of the body for relieving chronic to occasional low back ache. A great tool to use to become more flexible, learn to lengthen and lift the spine for improved energy and breath. Whole Body Moves will be included to build into your group classes and get more results from the Method. Hips and Sciatic Workshop: SO many of us have difficulty with hips and much of it comes from the chronic stiffness, the result of clenching muscles in the leg joint. We will use differing ball placements, different Whole Body Moves and, of course, include the great affect that breathing has on the pelvic floor. Scoliosis Workshop: Some of you may know personally how challenging this condition can be. Those who have this condition can experience intense pain. There is so much we can do to support the spine differently– giving relief through the understanding of breath and encourage the experience of oppositional movement patterns to lengthen the middle of the body. Breathing and Balance Workshop. Stand up straight. Easy to say if you are in tune to feeling the weight of your legs and lower body anchoring you to the floor. As we age, we don’t understand how our breathing patterns—especially how we have an unconscious tendency to hold our breath — prevents our bodies from being perfectly vertical. We live in the push pull of fighting to hold ourselves upright, only to lose the battle over time. These postural issues begin at a young age. Foot and Knee Workshop: Such a tricky area because, of course, when we have foot or knee problems we have a natural tendency to look at the feet and knees. From my experience, it has so much to do with the leg adjustment and realignment of leg joints. By making that connection, feeling more freedom in the support of the pelvic floor and freeing the breath, it can be amazing to see the changes. Whole Body Moves, which will build muscle tone, will be given as take-home homework. Neck and Shoulder Workshop: Who doesn’t feel the tension in this area of the body? First of all, we invariably hunch over our devices and that immediately contracts the diaphragmatic muscle, which then prevents any chance of getting any long- term relief. The rib cage can be the most magical area to connect to in terms of musculature. Most of us only understand how to relieve neck and shoulder issues by isolating the neck and shoulders from the rest of the body. Through the Whole Body Moves and improved breathing, time on the ball can be very beneficial. After Workout Relief Workshop: To prevent and heal injuries while having daily exercise: This workshop is essential for those who love to work out hard and then come home feeling great. But then what? Sometimes that hip seems to always tighten up after a few hours, or that nagging shoulder pain flairs up the next day. Learn what you can do to help your clients “undo,” learn the antidote to what we all love to do…push ourselves. Movement is health but let’s make sure that at the end of each day, we allow our body to realign and readjust. Submit two (2) 20-30 minute videos six months apart for review. These videos need to show two (2) group classes. If you are not teaching groups, then show a few friends in each video. These videos should demonstrate your Level 1 and 2 abilities, as well as how you can effectively teach a group. To maintain the integrity of the work, you are required to pay an annual fee and submit a 30-minute video of your teaching which will then be reviewed by Elaine Petrone and then discussed with you. Keeping your certification current allows Elaine to maintain the integrity of the Method. Relieve your Pain. Reduce your Stress. Reshape your Body. Eight video classes demonstrating the Method as well as supportive videos to answer frequently asked questions. Great way to gain a deeper understanding of the Method and how it works to benefit you both personally and professionally. For anyone who wants to develop a deeper understanding of the Method and to feel better at the same time. On completion of the Online Training you are eligible to become certified as a Miracle Ball Method Instructor. In order to complete the certification process you will need to submit a 15-20 minute video of yourself conducting a class for review. Another video is required to be submitted 6 months later. 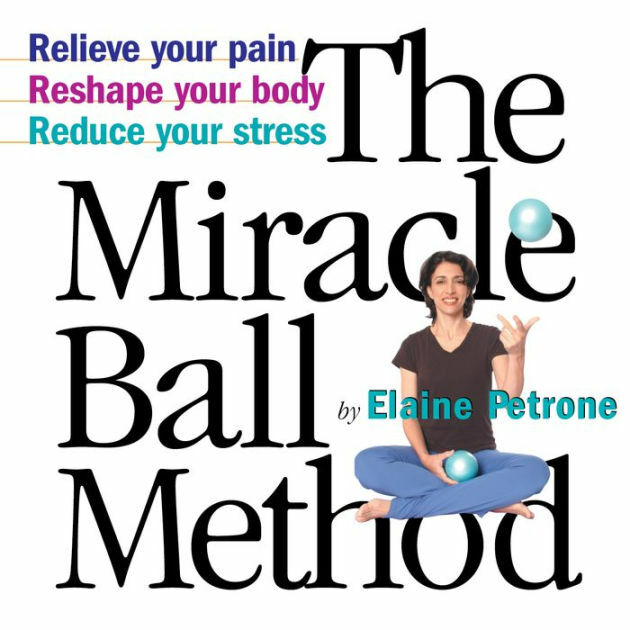 We encourage certified instructors to keep up with their Miracle Ball Method™ training by practicing the Method often, sending in additional videos for review, and taking the on-line course (Details coming soon to The Miracle Ball Method™ website). The more hours you practice, the more understanding you will have in your own experience of how the Method works. Teaching will then be easier. Unlike exercise, the advanced classes in some ways have simpler directions, but are harder in that they are counter intuitive. Once you understand how to allow gravity, weight and breath to stimulate your nervous system, you can understand how the body responds. That is the Body Dialogue that I speak of in my books. The Miracle Ball Method™ is a simple method, but people are not. For specific questions about The Miracle Ball Method™ Instructor Certification, please email us at contact@themiracleballmethod.com. NOTE: Miracle Ball Certified Instructors may purchase bulk orders of Miracle Balls, books and other Miracle Ball products at a discounted rate directly from The Miracle Ball Method™. Please contact: contact@miracleballmethod.com for more information and to order. Please let us know how your classes are going by sending us your training videos, or sending us messages through The Miracle Ball Method™ Facebook page. Or, you can email us at contact@miracleballmethod.com. We love to hear from you and your input is not only important but helps us continue to improve the therapy methods.